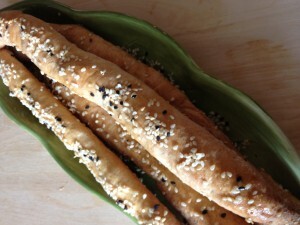 This recipe makes about 2 1/2 dozen and uses store made bread dough. Sea salt, olive oil and sesame seeds dress up the basic dough and give you a positively addictive final product. They’ll disappear before you know it so make plenty! 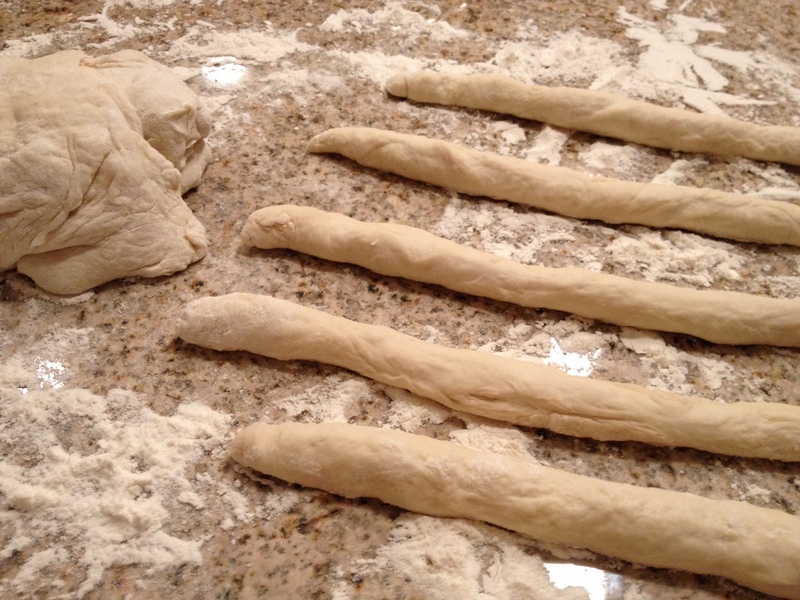 From a 1 lb bag of store made bread dough, pull off a small pieces, roll into a smooth ball and then roll between your hands until you have desired length stick. We loved this part as kids – it’s a great recipe to let children help with. The dough should be approx 1-2 inches in diameter to bake up nice and crunchy. 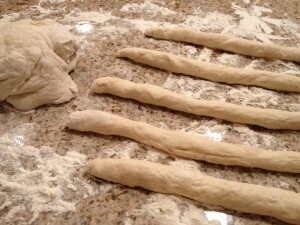 The store made bread dough has already risen so once you flour your work surface and roll out bread sticks, you’ll need to get them dressed and into the oven right away. You don’t want them rising too much a second time as the less the rolled dough rises, the crunchier your bread sticks will be. Once your sticks are rolled, place them on a baking sheet lined with parchment paper. Lightly brush each stick with a well-combined mixture of 1/2 cup of olive oil and 1 tsp of honey. This will help to keep the seeds on without making them too sweet. 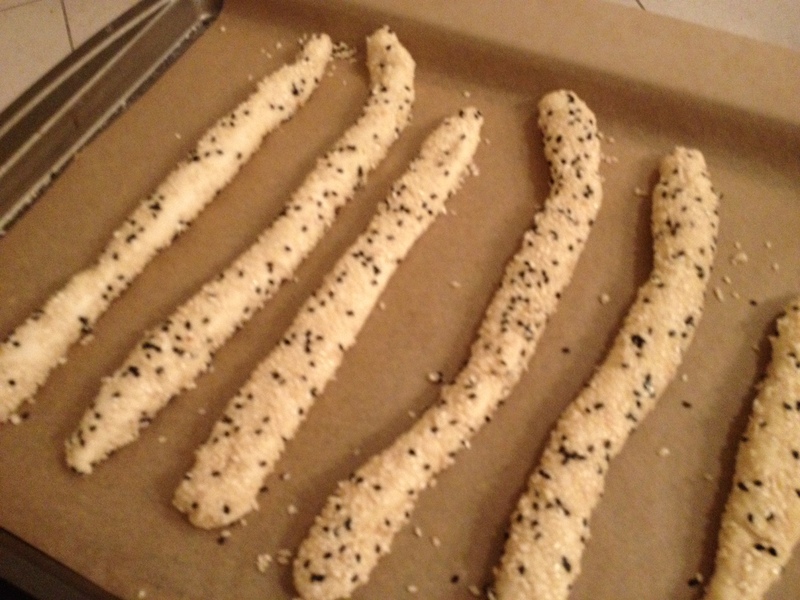 Sprinkle liberally with sea salt and then the sesame seeds. 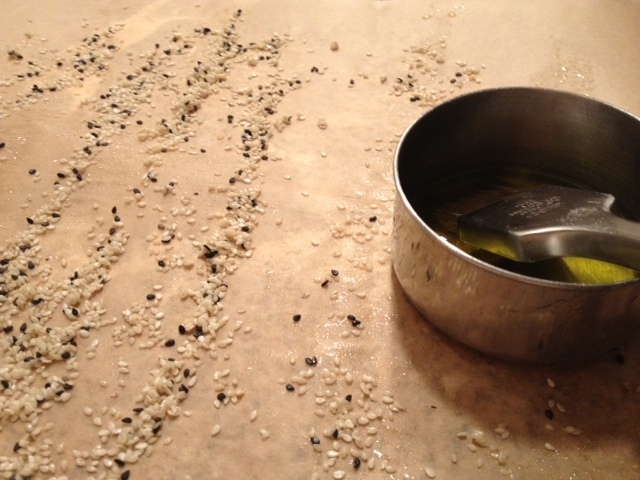 Roll dough sticks over onto seeds that have fallen between the rows so both sides are covered well. Brush away any extra seeds so they don’t burn. I like to use a combination of white and black sesame seeds as I think they make a prettier stick but feel free to use one or the other. 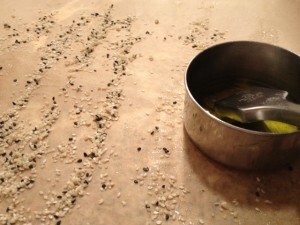 And there’s no need to toast your seeds ahead of time – the oven will take care of that! For kritsinia with a crunchy outside and lighter, bready center cook them at 350 degrees for 40 minutes or until they’re lightly golden brown. If you prefer a crunchier bread stick through to the center, cook them at 325 degrees for 1 hour again until they’re lightly golden brown. Serve these warm from the oven or store covered for 5 -7 days. My dad loves to use kritsinia to scoop up skordalia and my mom loves them with her tea. I know these simple, delicious snacks will become favorites of your family too! Hi there, I’m surprised you would use store bought bread dough. Non-vegan, GMO, not organic . . . store bread products are usually pretty vile. Do you have a recipe for dough here on the site that might be more appropriate? Hi Bett, Actually my store bought dough is vegan AND organic, also the dough’s flour is unbleached and unbromated. I believe that store bought products (from the right stores!) can be very handy when time is tight. And of course, it all depends on where you choose to shop. I was in Crete last year, and on the local market I bought something like this. 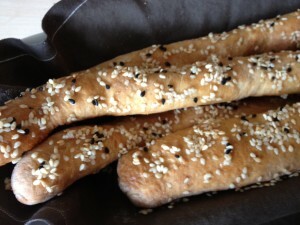 They where crunchy bread stick, covered in sesame seeds and had a cinnamon taste to it. I am however, unsure if these where the same things as described above. I’ve bee trying to find that out and maybe someone can help me with this…? I took a picture, maybe it helps….